My mom’s friend Genie says the best gifts are “comestibles,” things that can be devoured and quickly disappear. She’s right. Comestibles cut to the heart of everything that is good about this season: the act of coming together, of eating and toasting and sharing. There are plenty of ways to go with comestible gifts—jams, pies, cookies, shortbreads, cakes! But because the season is so sugar heavy, I like to veer in a different direction: savory. Our comestible gifts are often preserved meat. It started a few years ago when we bought a pig from our friend Drew, who farms in Truro. He delivered several hundred pounds of pork in November and come December we started wondering what to do with all that pork belly. I opened Darina Allen’s Forgotten Skills of Cooking. “Dry cure,” she recommended. A dry-cure can just be salt, or a combination of salt, sugar, and flavorings like spices and herbs. Before refrigeration curing was the only sure-fire way to preserve meat. The salt in the mixture pulls out the moisture and intensifies the flavor. The rule is about 1/2 an ounce of salt for every pound of meat, and if you follow this you can experiment a bit with other additions. We’ve played around and decided we like a combination salt, brown sugar, black pepper, and rosemary. Making bacon sounds hard, but it couldn’t be easier. 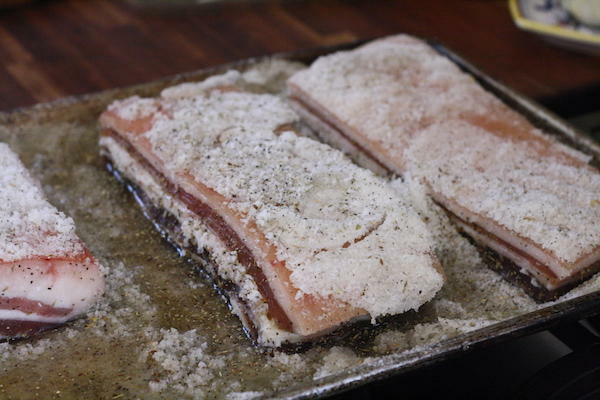 In a nutshell: you take a nice piece of pork belly, mix the salt with the other ingredients and rub it all over the meat. Then you let it this in the fridge for one to two weeks. We make our bacon on rimmed cookie sheets. We have an old fridge in the basement that gets turned on this time of year—mostly to house a large five-gallon pot of eggnog—but it fits the bacon too. Every few days my husband or I flips the bacon and makes sure the salt mixture is still rubbed in. It’s amazing how much moisture the salt absorbs. And yes, it’s also important to taste the eggnog. The longer you cure the bacon, the saltier it will be—but the saltier it is, the longer it will keep. You can’t really overdo it, though if you cure it for more than two weeks you’ll probably want to soak it to get some of the salt out before you slice it up and fry it. Last year we tried our hand at another homemade local meat gift—jars of tallow. We bought suet on the cheap from our local beef farmer. Suet is beef fat that’s been cut away from the muscle, but it’s still got tendons and a bit of meat attached; it isn’t clean. Cut it into cubes, our farmer recommended, and let it render in low, slow heat in the oven. We did as she said. After a few hours we poured liquid fat through a fine-mesh sieve and filled ten jars with pure gold. Instead of bird bait, now we had tallow. Tallow is what McDonalds fries were cooked with when they got our attention in the first place. In the 90s the company started frying in vegetable oil, ostensibly for our health, but tallow’s since been vindicated. You can make pretty labels and present the jars with recipe ideas and ribbons. Maybe your family prefers lard, or liverwurst, or sausage. Maybe the woman raising pigs or goats or geese at your farmers market has a different tip. Maybe the friends you aim to please love hot sauce or jam. Maybe they’re vegetarian or vegan; maybe they’re into smoked fish. Whatever it is, keep your ear to the ground, your hands outstretched, your heart in the kitchen. It’s time to make and share comestibles, with cheer. 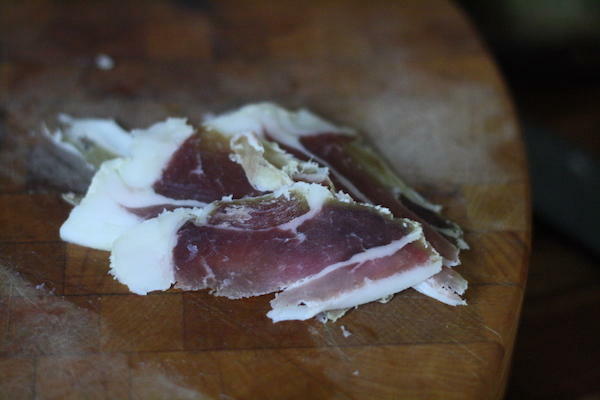 Here is a link to Elspeth's blog where you'll find recipe ideas and photos of the meat curing process. Fish is important for good health, but it can be expensive. This week on the Local Food Report, Elspeth Hay talks with the fishermen and organizers behind a program called Fish for Families that's working to get high quality local seafood to Cape Cod families in need. Khen Tran is known around the Vineyard as the Egg Roll Lady because of the food she cooked and sold at the West Tisbury Farmers’ Market for 20 or so years. She was a Vietnamese immigrant who first worked as a nanny and a cook for a family on the Island and from there she became a chef and built up her own business. On my last visit home to Wisconsin, one of my oldest friends and I were at the thrift store and came across a used ice cream maker which got us talking. She swears by her hand crank model but I love the convenience of my electric one. I’m standing in front of 18 mason jars, an impeccably clean kitchen counter, and about 16 pounds of fresh Bluefin tuna. Why? Well, a few years ago, Ken Mason and his wife took a trip to Portugal. Amaranth was a key crop for the ancient Aztecs, but fell out of favor after European explorers arrived because of its association with pagan worship. This week on the Local Food Report, Elspeth Hay learns about a modern day crop of amaranth growing at the home of Truro farmer and educator Stephanie Rein.